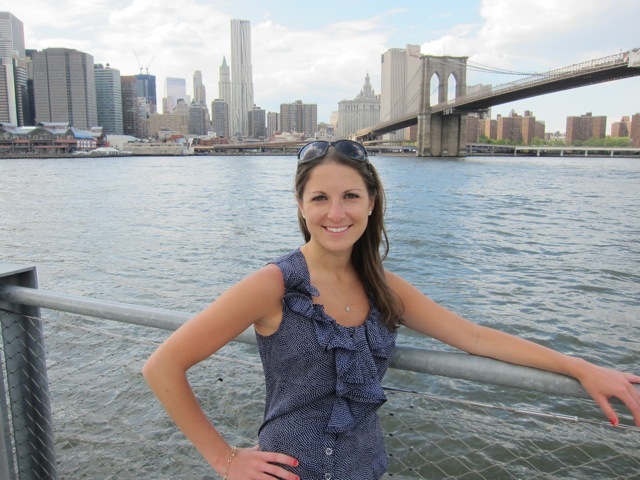 Perfect NYC Weekend | Run, Lindsay, Run! On Friday night, a lot of hard work (and late nights) finally culminated with a media event at the Thompson LES hotel. This place was the perfect event venue– swanky and looked out onto the pool. Soooo downtown NYC 😉 After the event wrapped, my two coworkers and I were searching for a bite to eat and stumbled upon this cute paella/tapas bar in Nolita, Socarrat. We shared some tapas and glasses of wine, and it was delicious! Sadly my feet were killing me from being in heels, and I called it a night after that. I was wiped! 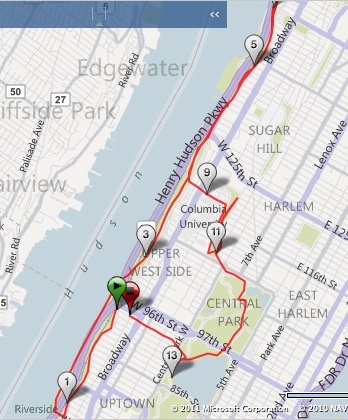 I woke up Saturday morning and got in an easy 8 mile run in Central Park around the outer loop. The sun was shining but I was still a bit annoyed most of the water fountains weren’t on. What’s up with that? 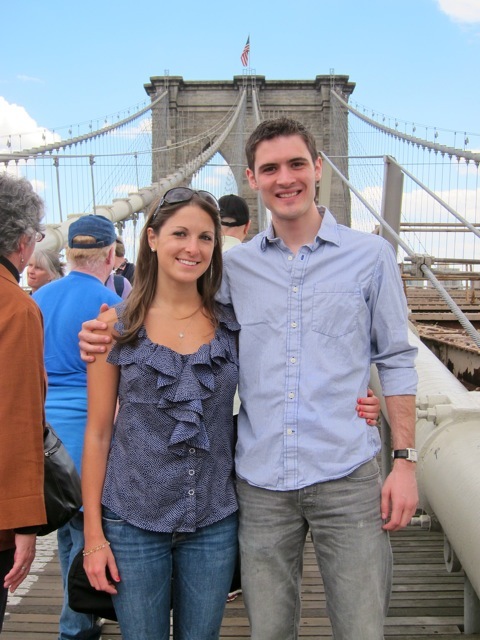 Afterwards, Dan came over and we embarked on an adventure over the Brooklyn Bridge! 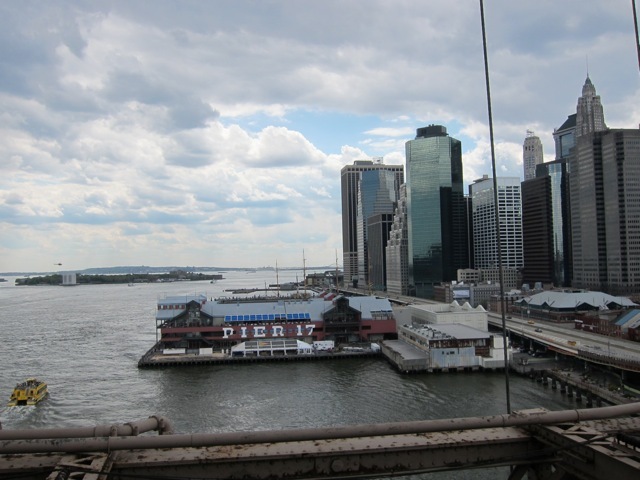 Once we crossed, we walked down to Brooklyn Bridge Park. 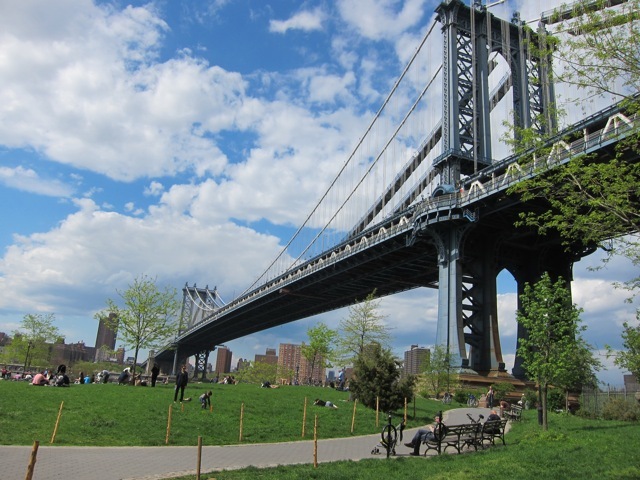 It was perfect, with great views of the Williamsburg and Brooklyn Bridges. We finally set up shop on a blanket and soaked in some sun and views. And of course no day is complete without dessert! 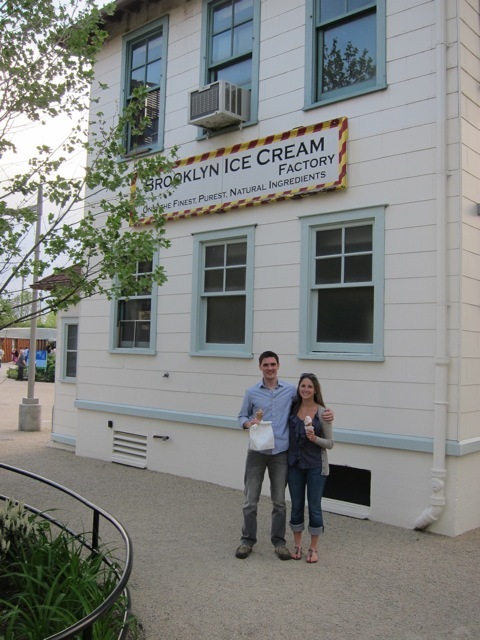 The Brooklyn Ice Cream Factory only serves 8 flavors, which is a clear indication they do ice cream, and they do it right. My strawberry cone hit the spot! After all that food, I woke up on Sunday morning ready to go for my last long run before the Brooklyn Half-Marathon. I logged 14 miles through Riverside, Morningside, and Central Parks. I’ve enjoyed running with my iPod when going solo, especially for a long run to keep me entertained, but I awoke to find I hadn’t charged it! So, I headed out the door sans iPod and it was actually pretty nice to be alone with my thoughts. 7:42 pace overall; not bad considering the inclines! After my little tour of all of uptown NYC’s parks, I quickly showered and headed to another one of my NYC favorites for Mother’s Day, Norma’s! My mom and I came here last year for Mother’s Day brunch and quickly decided it had to become a tradition. Can you tell why? Check out the french toast and belgian waffles! 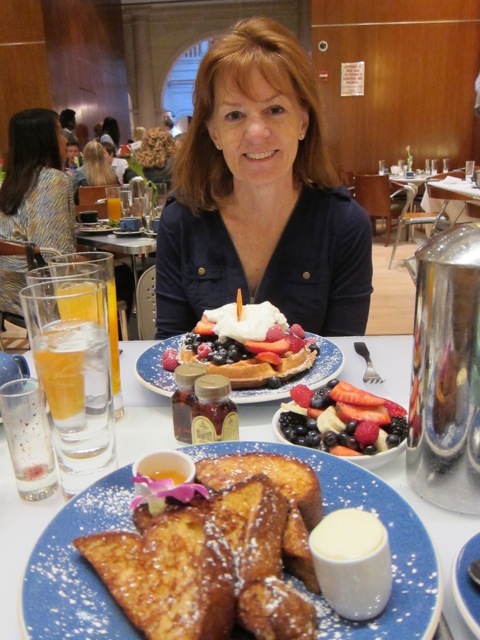 After brunch, we walked and window shopped on Madison Avenue, then walked across Central Park back to my apartment. All in all, a relaxing Sunday! It was nice to spend the entire weekend home, and enjoy such nice weather outdoors. What was the best part of your weekend? What’s your favorite brunch item? 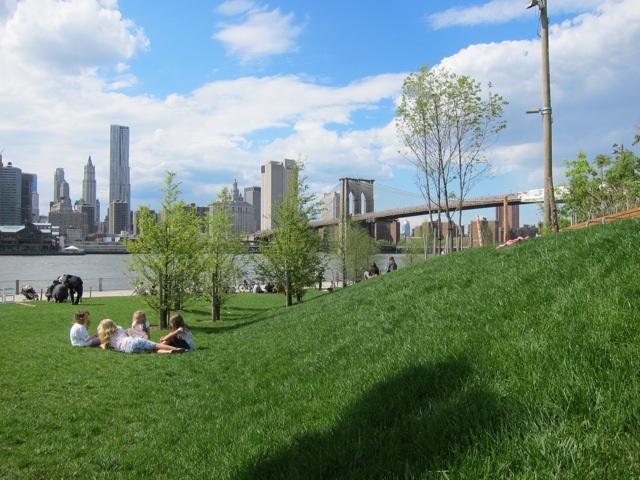 This weekend, I loved walking around (and eating my way through) Brooklyn Bridge Park. It was great, I’d definitely go back! For brunch, I am totally a ‘sweet’ vs. ‘savory’ person. Give me fruity, sugary, decadent waffles, pancakes, french toast, crepes, oatmeal, yogurt– yum! I like eggs, but they are more ‘meh’ to me since I do not enjoy the taste of egg yolks and I can make egg whites any day at home. I used to run Riverside Park in college. I see you ran through my alma mater – looks like 116th. Nothing better than 116th/college walk in Nov/Dec when they string the trees up with lights. Makes me miss NYC! Best part of my weekend was returning to running, trying a new recipe and going on a dinner date with Ben. So glad you took advantage of the beautiful spring weather! 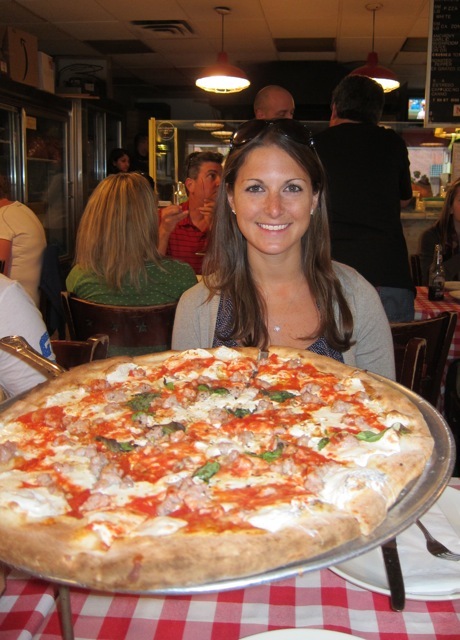 Love your NYC weekend – Spring weather needs to be taken advantage of! I always face the sweet vs. savory dilemma when it comes to brunch, but I usually go with savory eggs mostly because I want the accompanying hashbrowns/homefries. Even though I was in California for the weekend, I was SUPER jealous of everyone telling me how awesome the weather was back here! It’s actually kinda chilly in San Francisco, so I was sad that it was warmer here. I loooooove spring weather and when it’s warm enough for tank tops and flip flops!